Building on the theme “Information Systems Fostering Innovation and Business Opportunities”, MCIS2016 seeks high quality submissions that explore the opportunities and challenges related to IS as a driving force for Innovation in Business and Society. Research Papers are full-length papers (up to 12 pages). Research-in-Progress papers are promising but incomplete research projects that will benefit from the feedback of other MCIS participants (up to 7 pages). Abstracts will be presented in a poster session (up to 3 pages). All accepted papers will be presented at MCIS2016 and published in the MCIS2016 proceedings. To participate in the Doctoral Consortium, or to organize a Panel discussion, or a Tutorial, please see the separate calls for these events on the MCIS 2016 website. ACE – the leading scientific forum for dissemination of cutting-edge research and innovation in the area of entertainment computing is inviting the submission of proposals to the children creativity lab that will take place as part of its 11th conference to be held in Funchal, Madeira, on11–14 November 2014. The ACE Children Creativity Lab offers a unique opportunity for local children and researchers from around the world to come together and inspire one another in exploring and creating the future of entertainment technology and unleashing its potential to empower as well as entertain. The ACE Children Creativity Lab is fueled by imagination and technology. Children offer a boundless amount of imagination and creativity and given half a chance will breath new life and find a new purpose to any object be it a discarded cardboard box or a cherished pen with the pen turning into a spaceship and the cardboard box transformed into a space port with the beat of an eyelid. Present day technology offers the availability of smart materials capable of changing their color, shape, stiffness and so forth and of cheap and simple to use electronics capable of controlling and driving these materials. The ACE Children Creativity Lab offers a space in which the two can meet. We are currently seeking catalysts capable of sparking novel and interesting interactions between children and technology. In order to take part in the ACE Children Creativity Lab participants are expected to propose imaginative approaches to conducting creative lab sessions with children. Each proposal should seek to empower and support children in exploring materiality and functionality using any mixture of physical materials and digital technology. Selected participants will be invited to run their proposed creative lab session with a group of local children and to present and discuss their work during the conference. Submitted proposal papers will be included in the conference proceedings and presented as part of the poster session. ACE 2014 proceedings will be published in the ACM Digital Library as part of the ACM International Conference Proceedings Series (ICPS). Decision notification date: August 11, 2014. The theme of ISD2014 conference is Transforming Organisations and Society through Information Systems. The conference focuses on mutual influences between information systems and organizational structures, processes and people and promotes research of methodological issues and ways in which the IS designers and developers are transforming organizations and society through information systems. 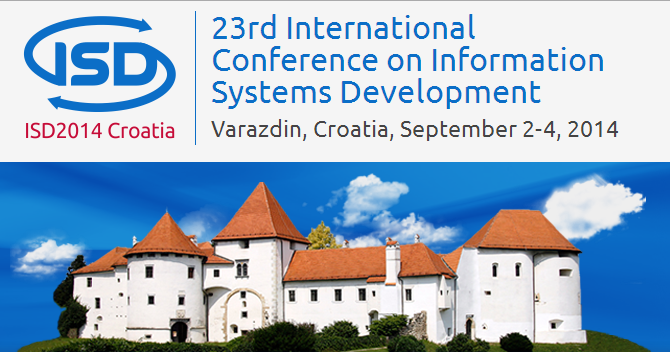 Conference papers will be published in ISD2014 Proceedings with ISBN. Presented papers will be eligible to be extended and sent to review for publishing by Springer. The International Conference on Information Resources Management (Conf-IRM) is an affiliated conference of the Association for Information Systems (AIS). It provides a peer-reviewed forum for researchers from across the globe to share contemporary research on developments in the fields of information systems and information management. It seeks to promote effective and vibrant networking among researchers and practitioners from around the world who are concerned about the effective management of information resources in organizations. This network of researchers views fostering the development of emerging scholars in the information systems and information management fields as its primary task. Consequently the conference is designed to provide a venue for researchers to get substantive and beneficial feedback on their work. Conf-IRM builds on the traditions of the Information Resources Management Association (IRMA) Conferences. Under new leadership, the IRMA Conference has been re-positioned and is now known as Conf-IRM. 1. Management of Web and Heterogeneous Data (Theme Track). 2. Knowledge Management and Business Intelligence. 3. IT Design, Development and Services Management. 4. Green IS/IT Strategies and Technologies. 5. ICT for Development and Economic Prosperity. 6. Information Security, Privacy, and Risk Management. 7. ICT in Government, Education, and Healthcare. 8. Impacts of ICT on People, Organizations, and Society. 9. Management and Governance of IT. 10. E-Business, Web 2.0 and Social Networks. 11. ICT in ASEAN, Latin America and the Caribbean. The 2014 World Conference on Information Systems and Technologies (WorldCIST’14: http://www.aisti.eu/worldcist14) is a global forum for researchers and practitioners to present and discuss the most recent innovations, trends, results, experiences and concerns in the several perspectives of Information Systems and Technologies. We are pleased to invite you to submit your papers to WorldCISTI’14. All submissions will be reviewed on the basis of relevance, originality, importance and clarity. H) Information Technologies in Education (ITE). The Australasian Conference on Information Systems (ACIS) is the premier conference in Australasia for Information Systems academics and professionals, covering technical, organisational, business, and social issues in the application of Information Technology. In 2013, the ACIS Conference will be hosted by the School of Business IT and Logistics at RMIT University. The event will take place at our City Campus in the new Swanston Academic Building from 4th December 2013. The Swanston Academic Building is located right in the middle of Melbourne’s CBD. Digital Business including E-Business, E-Government and etc.